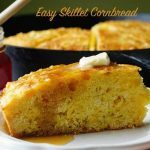 Easy Skillet Cornbread - making homemade cornbread is easy. Use a box, doctor it up - delicious and makes the whole house smell amazing while it is baking! Preheat oven & skillet to 300 degrees. In a large bowl add the cornbread mix and the remaining ingredients. Mix until just combined, a few lumps are okay! Carefully remove the skillet from the oven. Coat the bottom & sides of the skillet evenly with canola oil. Pour the bowl of ingredients into the skillet. Bake for 40-50 minutes until a knife inserted comes out clean.